Keaton began her show-business career in summer stock, eventually landing an understudy job on Broadway in the musical "Hair," in which she starred for most of 1968. She first became a familiar face on TV commercials, and made her film debut in Lovers and Other Strangers (1970). She then managed to hold her own among the powerhouse cast of Francis Ford Coppola's The Godfather (1972), playing the wife of Mafia family scion Al Pacino, a role she reprised in the 1974 and 1990 sequels. Her quirky side got plenty of exposure in the Allen films and such trifles asEB>. For Now (1976) and Harry and Walter Go to New York (1976), but she proved her dramatic abilities in Looking for Mr. Goodbar (1977), playing a sexually repressed Catholic schoolteacher whose later promiscuity leads to tragedy. After appearing in Shoot the Moon (1982), the emotional domestic drama, Keaton costarred with then-lover Warren Beatty in his ambitious but financially unsuccessful Russian Revolution epic, Reds (also 1981 and Oscar-nominated as Best Actress), then took a brief sabbatical. 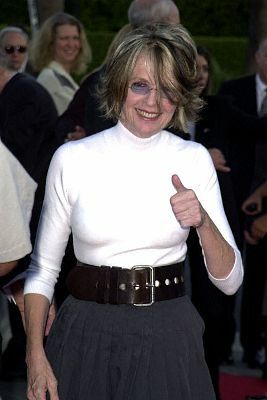 Her return to the screen, in Mrs. Soffel (1984), was largely unheralded, and the mediocre box-office performance of The Little Drummer Girl (1984) failed to appreciably check her career's apparent decline.Crimes of the Heart (1986), an adaptation of Beth Henley's Pulitzer Prize-winning play about Southern sisters, forced her to compete for screen time with Jessica Lange and Sissy Spacek but proved to be a more satisfactory vehicle for her than previous outings. She cameoed as a nightclub singer in Woody Allen's Radio Days before starring in Baby Boom (both 1987) as a fast-track corporate shark whose life changes dramatically after she "inherits" a baby. The film was a popular success that restored the luster to Keaton's tarnished star, and reminded audiences of her considerable comic prowess. Unfortunately, her follow-up films-including The Good Mother (1988) and The Lemon Sisters (1990)-didn't sustain that momentum. In 1991 she fared better in the hit comedyFather of the Bride which saw her playing Steve Martin's wife in a placid, decorative manner most unusual for her. The following year she was well cast opposite Ed Harris in the political-themed romantic comedy Running Mates (1992, made for TV). She provided a canine voice-over for 1993's Look Who's Talking Now and played the title role in a 1994 TV movie, Amelia Earhart She first tried her hand behind-the-camera with an oddball quasidocumentary, Heaven (1987), and then piloted the well-received cable-TV drama Wildflower (1991). She directed an episode of "Twin Peaks," and earned an Emmy nomination as Best Director for an After School Special, "The Girl With the Crazy Brother" (1990).